Xylitol is a sweetener which can be found in sugar-free products such as some baking mixes, cakes, buns, sugar-free chewing gum and mints, medicines, vitamines, peanut butter, sweets, jam and honey. Signs of this toxicity may include weakness, lethargy, collapse, vomiting, tremors, jaundice or hypoglycaemia. If you pet has ingested a food containing Xylitol, please contact your practice immediately for advice. 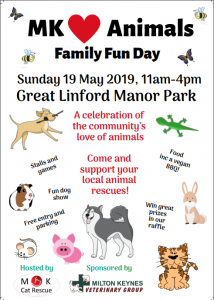 Bring your family and friends along on 19 May to meet local animal charities, play games, win prizes, buy items for sale and have a fun day out. There will be a fun dog show, food for sale (inc a vegan BBQ) and lots more. Dogs are welcome too! Free entry and parking. Run by MK Cat Rescue and sponsored by Milton Keynes Veterinary Group. With the Easter Weekend soon approaching, we want you and your pet to have a HOPPY EASTER and therefore during this month we will be making you aware of potential dangers to your pet. Some of us will have started to prepare for Easter by buying Easter Eggs for the occasion. Whether it be to give to family and friends or arrange an easter egg hunt for the little ones. Easter eggs are made of cocoa solids containing Theobromine which is the substance that is poisonous to our pets. All types of chocolate whether it is white, milk or dark chocolate can contain Theobromine but at different quantities. Signs of chocolate toxicity can include restlessness, vomiting, diarrhoea, increased thirst, elevated heart rate, increased blood pressure, abnormal heart rhythm, tremours or increased body temperature. 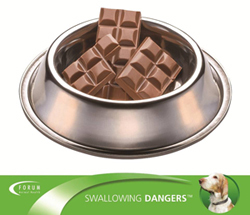 In the situation where your pet has indulge in your chocolate supplies, please contact your veterinary practice immediately along with the chocolate packaging if possible to show or discuss with your vet. Feline leukaemia virus is a viral infection occurring worldwide and was first discovered in 1964. The virus is spread in large quantities from an infected cat within their saliva, as well as faeces, urine and milk. The virus is short lived outside the infected host and will not survive in the environment for any length of time. Therefore cats are most likely to become infected through direct contact/ingestion of the virus. The virus will then to begin to replicate within tissues and spread within the animal’s immune system. Immunosuppression is one of the biggest clinical signs of this disease, where individuals will suffer from persistent or reoccurring diseases with progressive deterioration over time. Clinical signs can vary between each individual but may include fever, lethargy, weight loss, inappetance, and persistent or reoccurring respiratory, skin and intestinal issues. In more severe cases anaemia and neoplasia may also be seen. FELV can be diagnosed by an in-house snap test using a small blood sample. 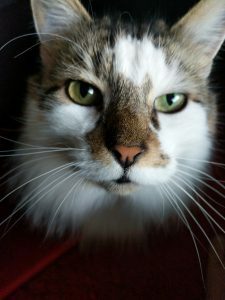 Unfortunately as per other diseases there is no cure for this disease and therefore infected cats are managed symptomatic and with supportive therapy. Vaccination can provide prevention of this disease. 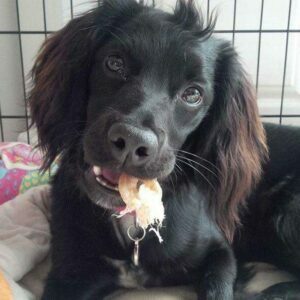 At Milton Keynes Veterinary Group, we will always discuss your pet vaccinations and your concerns. Our practice protocol is to revaccinate against Feline Leukaemia Virus on a yearly basis following primary vaccinations, in accordance to vaccine manufacture guidance. 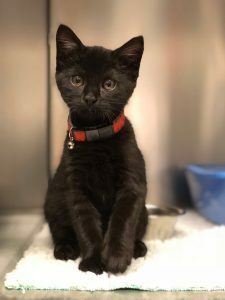 This disease is caused by feline parvovirus otherwise known as Feline Panleukopenia Virus or Feline Infectious Enteritis and is a disease threat to the feline population especially in rescue shelters. In some cases, infection can lead to a potentially fatal outcome. It is spread by direct contact with infected faeces and indirectly via the environment. Carriers of this disease can continue to excrete the virus for at least six weeks from infection. Unfortunately there is no cure for this virus and it is highly contagious to other individuals. Vaccination is available in order to prevent this disease, this being one of the diseases routinely vaccinated against within the UK. We feel owners should be aware of this disease as well as the potential symptoms in order to detect the disease at an early time. If you have any further questions regarding this disease, please don’t hesitate to contact the practice on 01908 397777.